Mushrooms, herbs, and spices are not included in most green drink formulas even though they are some of the most nutrient-dense foods on the planet. Take, for example, the simple white button mushroom. 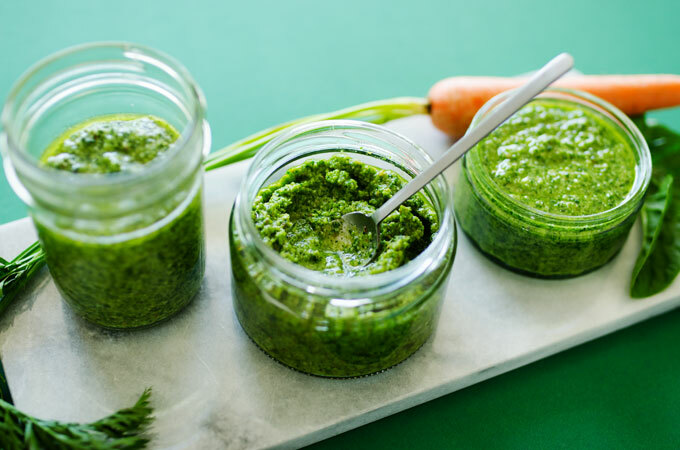 It has more antioxidant power than green peppers, carrots, green beans, and tomatoes! Now, at this point, you might be wondering, “Is there a green drink that actually fulfills all five of these criteria?” Well, yes, you can make your own. Rather than accept the inferior green drinks on the market, create a NEW green drink that will meet all of your standards and then some. You can have your own Green Drink Made with Fruits, Veggies, Mushrooms, Herbs, And Spices That will make your concoction tastes Absolutely DELICIOUS! This recipe will of your superior green drink, will satisfy all five of our major criteria… and then some. It’s tough to drink green drinks that taste bad. That’s why we made sure ours had a pleasantly sweet flavor -- so you would actually ENJOY drinking it every day. So what exactly is included in Organic Greens? What should you include in your powerful Organic Green Drink? Check it out! Alfalfa Grass Juice - packed with vitamins A, B1, B6, C, E, and K as well as minerals like calcium, potassium, iron, and zinc. Studies show alfalfa has immune supportive and antioxidant properties and can help maintain your health. Kiwi Fruit - contains powerful anti-aging compounds and 2x the vitamin C of an orange. Research suggests kiwi may also promote eye, lung, and brain health as well. Grape (Skin, Fruit, Sprouted Seed, and Stem) - a rich source of polyphenols and healthy flavonoids, these parts of the grape plant are shown to carry numerous benefits. Maitake Mushroom - another traditional medicinal mushroom beloved for millennia, Maitake is shown to be a bountiful source of vitamin D, and it may also help maintain blood sugar levels that are already within a normal range. Tomato - filled with alpha and beta-carotene, lycopene, and lutein, tomatoes have been clinically proven to maintain heart health. Papaya - far too many people miss out on the advantages of consuming papaya. Researchers are finding papain, a unique enzyme in papaya, and other key nutrients found in the fruit may support overall health. Banana - one of nature’s richest sources of potassium, the vitamins and nutrients in bananas are important for heart health, positive mood, and bone support. Carrot - one of the richest natural sources of vitamin A and beta-carotene, an essential nutrient for eye health, immune function, and much more. Red Beet - packed with b-vitamins, manganese, and betaine, red beets support emotional and nervous system health. Red Leaf Lettuce - unlike its iceberg cousin, red leaf lettuce has a variety of essential nutrients like calcium, magnesium, phosphorus, thiamin, riboflavin, folate, and iron. Kale - an ultimate green superfood. Kale has several times the recommended daily amount of vitamins A, K, and C, plus a healthy dose of protein. Spinach - another nutrient dense leafy green, spinach could improve digestion, flush bodily toxins, and encourage healthy skin. Broccoli - belonging to a group of veggies known as cruciferous vegetables, broccoli is a true miracle food, thought to support immunity, support bone health, maintain cholesterol levels that are already within a healthy range, and cleanse the body. Green Leaf Lettuce - similar to red leaf lettuce, green leaf lettuce puts regular iceberg lettuce to shame. While iceberg’s nutritional value is little to none, green leaf lettuce offers an assortment of important nutrients like vitamins B-6, A, C, E, and K.
Collard Greens - also known as marrow-stem kale, collard greens are an often overlooked nutritional treasure, believed to possibly improve sleep and mood, support digestive tract health, and promote healthy hair and skin. Rose Hip - possesses a potent combination of vitamin C, antioxidants, polyphenols, and other beneficial natural compounds, rose hips are believed by many to oxygenate the body, help maintain blood sugar levels that are already within a healthy range and support the immune system. Passionfruit - a valuable source of soluble fiber, which helps you feel less hungry between meals, maintains blood sugar levels that are already within a normal range, and supports digestive health. At this point, you may be thinking this is already an impressive green drink. And, of course, it is. But we’re just getting started! We’ve only covered 43 of the 71 powerful ingredients that you can include in your Organic Green Drink/Smoothie! Flax - a valuable source of fiber, lignans, and Omega-3 fatty acids. Sprouted Chia Seed - rich with antioxidants, soluble fiber, and healthy Omegas. Chia also helps you feel less hungry between meals and is a source of protein. Sprouted Canihua Seed - an ancient grain superfood of South America. Canihua is packed with protein, polyphenols, and healthy fiber. Sprouted Pumpkin Seed - in addition to its high levels of magnesium and immune- supporting antioxidants, pumpkin seeds may help support prostate and bladder health. Sprouted Hemp Seed - tender hemp seeds, sprouted to increase their nutrient content even further, contain plenty of Omega-3 fatty acids, fiber, and essential minerals. Sprouted Sunflower Seed - an exceptional source of vitamin E, zinc, and selenium. Sprouted Sesame Seed - contains over 100% the recommended daily value of several trace minerals, including calcium, iron, magnesium, copper, and manganese. Ashwagandha - an adaptogenic herb research suggests could help support thyroid health, reduce stress, and promote overall wellness. Sprouted Fava Bean - one of the most nutrient dense beans in the legume family, fava beans may help support heart health and can help you feel full between meals. Goji Berry - native to China, goji berries have a broad range of benefits, such as potentially improving sleep quality, eye health, and the immune system. Now, I want to draw your attention to two very important things about our list… FIRST, all the seeds listed are in SPROUTED form. Because sprouting can cause the vitamin and mineral content of the seeds to MULTIPLY by up to 4X as much as normal! Many ingredients are from a DOUBLE fermentation process that enhances and maximizes the nutritional value you can normally extract from them. It’s important to note that when fermented foods are made (like red wine, for example), they only go through a fermentation process. and maximizes the vitamins, minerals, polyphenols, and good bacteria your body is able to absorb. Then you need to be taking broad spectrum digestive enzymes like those included in the list above. Cellulase and Hemicellulase - These enzymes help to break down and digest cellulose into simple sugars. This is important because plants and vegetables contain a high percentage of cellulose in them. The cellulase enzyme helps you to digest vegetables, leafy greens, and other plant foods. Beta-Glucanase - Beta-glucanase helps process cellulose plant fiber, cereal bran fiber, and parts of certain types of fungi, yeast, and bacteria. Amylase and Glucoamylase - These enzymes help to break down starches like those found in potatoes, corn, rice, wheat, and other vegetables. Phytase - Phytase is an essential enzyme in the digestive process as it unlocks phosphorus and other minerals that are bound up in certain plant-based foods. Phytase is a key enzyme for bone health, and is used to increase the nutritional value of grains, legumes, seeds, and corn. Alpha-Galactosidase - Alpha-galactosidase helps break down and digest heavy carbohydrate foods like beans, broccoli, cabbage, and cauliflower. It can support digestion. When you use these ingredients in your green drink or smoothie, you'll have the most advanced greens drink or smoothie period... I’m not kidding. And I hope you’re able to see that as well. After all, we’ve spent countless hours putting this list together for you. You may not be able to use or even find all the ingredients listed, but you get the point. You can add A Powerful Probiotic + Fulvic & Humic Acid. Adding a powerful probiotic will encourage the growth of good gut flora…Yes! Bacillus subtilis - supports the digestive system. And last but not least, you can include an infusion of fulvic and humic acid. The best part is that you’re making your own organic green juice to make sure you're getting fulvic and humic acid in every single serving you make -- which is just one more way you’re supporting your health and your immune system. Everybody Who Wants Better Overall Health, Should Be Making Their Own Organic Green Juice or Smoothie…You can do it. Try to add an infusion of fulvic and humic acid that carries nutrients directly into your cells while cleansing the body… BOOM! 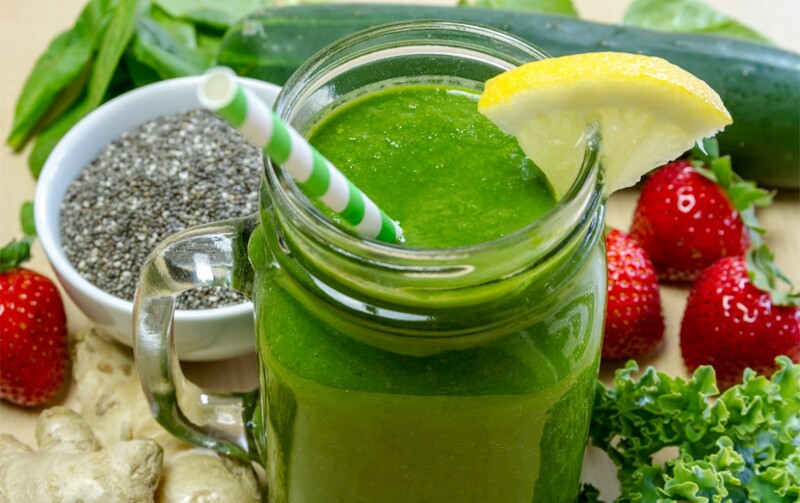 Health in a glass of Organic Green Juice or Smoothie.